When the cowboys go out to drive the cattle, they ride from one end of the pasture to the other. By the time they reach the far end, they'll know where all the cows are, and they turn around and drive them all back. Horse catching up with a cow in the team roping event at the college rodeo in Brownwood. All the cattle have been gathered at the end of the pasture, and now they only have to drive for half a mile before they put them in the pins. This is usually the easy part of the job, unless some of the cattle decide to run off. Not this day, though. Cowboys in West Texas dress a certain way. Cowboy hat, long-sleeve button-down shirt, jeans, boots and chaps. Your shirt has to be tucked in your pants. Showing up at a ranch any different, is seen as a sign of disrespect from the old cowboys. 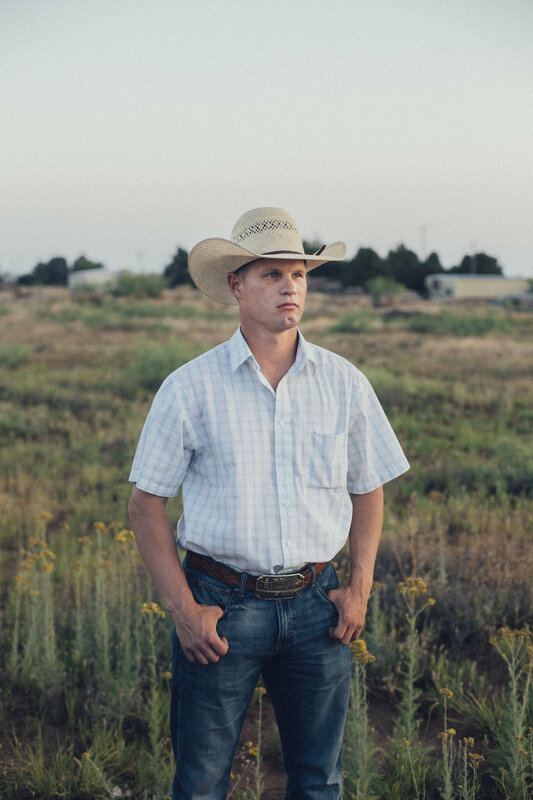 Hawkins is a rodeo rider at Odessa College, and him and Shawn are best friends. They're together almost every day working, eating, laughing and training. Hawkins rides saddled bucking horses. This summer he became the 8th best in the nation, at the National College Rodeo Finals in Casper, Wyoming. Paisley looking out the back of the pickup, to check I was alright. Every beginning of a rodeo starts with the national anthem and a prayer. Here is the coach of Odessa College, C.J. Aragon, with one of the athletes, Jake Trujillo. Shawn checking out the materials for building a new road. College students have a final blowout in Stephenville, Texas after the final rodeo of the season. Only the College Finals in Casper, Wyoming is left. Ty Ellis after the last college rodeo of the season in Stephenville, Texas. His roommates and girlfriend put a cigarette in his mouth, to try and convince him that he smoked cigarettes the night before, even though he never smoked before. Shawn watches the stars with his daughter, Paisley Jo, outside the house of his father. "My kids have made me a better man. I wouldn't change it for anything in the world". Hawkins carrying Shawn's daughter Paisley into the house after a long night. Boy dragging his horses to cover in a hail storm in New Mexico. Marvin and his son Dylan at a barbecue in West Texas.